Professor (Dr.) C. Raj Kumar, vice chancellor of Sonipat, Haryana based O.P. Jindal Global University (JGU) recently spoke during the Caspian Week at the World Economic Forum 2019 in Davos, Switzerland. Prof. Kumar is the only Indian vice chancellor invited to speak at this year’s WEF in Davos. At Davos, Prof. Kumar spoke on the theme “Philanthropy and Higher Education: The Indian Experience of Building a Knowledge Society through Universities”. The speech addressed key issues in India’s higher education, impedance of research and knowledge creation, internationalisation and collaboration among universities and the challenges of building world-class universities in developing and emerging economies and potential lessons from the Indian experience. The establishment of private universities in India, he said, has been highly recognised by national authorities and by global rankings agencies. Prof. Kumar cited the example of JGU as a model for corporate philanthropy and institutional excellence for building private universities in developing countries. Professor Kumar cited the example of O.P. Jindal Global University in India as a stellar example of how corporate philanthropy coupled with notions of academic freedom and institutional autonomy has helped India see the emergence of a new private, not-for-profit, global university within a short span of time. It is noteworthy that JGU, which was promoted just a decade back by Naveen Jindal, has led the emergence of a new generation of private and philanthropic universities in India. JGU is clearly the most international university in India with over 70 full time faculty members recruited from 32 countries in the world and it maintains a 1:10 faculty-student ratio. This is just 16 percent of JGU’s total faculty strength of nearly 440 mentoring nearly 4300 students. The various distinctions attained by JGU in recent years include the award of the highest grade “A” by the National Assessment and Assessment Council in India and grant of “Autonomy” by the University Grants Commission and the Ministry of Human Resource Development, becoming one of the only two private universities in India to achieve this coveted recognition. 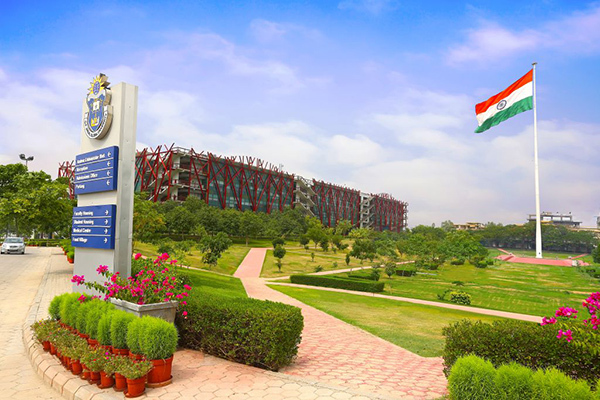 JGU is the youngest Indian university to feature in the QS World University Rankings by breaking into the QS BRICS Rankings 2019 and QS Asia Rankings 2019.